Our bilingual South Beach wrongful death lawyers at the Wolfson Law Firm can help you if you lost a loved one due to negligence or intentional acts. If you call us for free consultations at 305-285-1115, we will listen to you carefully and determine if you have a case to pursue compensation. You’ll know the answer at no cost. If you choose us to represent you, you should know that we never ask for fees unless we recover for our clients. Call us now and let’s see what can be done on your case. South Beach is a famous neighborhood in Miami Beach, known as the Sun and Fun Capital of the World, The Blue & Pink, or The American Riviera. It is a great place to spend time at, but for some people, it's the last place they have ever seen. We are South Beach personal injury lawyers and every day we talk to people who have sustained injuries there or have lost a loved one due to wrongful death. If you are among the unfortunate who have lost a close person due to a fatal accident in South Beach, you should call the best Miami wrongful death lawyer you can find as soon as possible. There is nothing that could turn back time and save your loved one, but you can find some semblance of justice by obtaining compensated through damages recovery procedures. 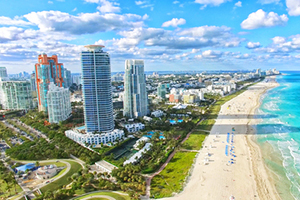 South Beach is located east of Miami, between the Biscayne Bay and the Atlantic Ocean. It is connected to Miami by MacArthur Causeway and Venetian Causeway. Although a small neighborhood of 40,000 residents and many more tourists, it has its own neighborhoods, which include San Marino Island, South Pointe, City Center, Di Lido Island, Palm Island, Belle Isle, Hibiscus Island, and others. It has many commercial areas, such as Ocean Drive, Lincoln Road, Washington Avenue, Espanola Way, West Avenue Corridor, and others. You may think that it is impossible to pursue compensation or get the justice your family deserves, but you should first speak with one of our South Beach wrongful death attorney. We will listen to you and evaluate the facts. We will also conduct the necessary investigation to make sure we examine all possible avenues of recovery. Once we have all the information, we can advise you what your legal options are to go forward. That’s why you should us now at the Wolfson Law Firm. There is no cost for knowing if you are eligible for compensation, how much is your case worth, and how to get the justice you deserve. You can reach us anytime at 305-285-1115.